Manufacturer & Supplier of Power Distribution Blocks. Our product range also comprises of Control Panels, Electrical Control Panels and VFD Control Panel. Our technical expertise enables us to offer a quality assortment of Power Distribution Blocks. 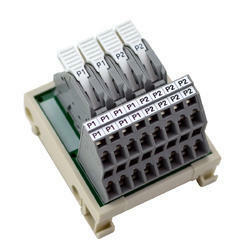 These distribution blocks are used to centralize earthing on the entire panel with ultimate uniformity. Our provided distribution blocks are tested against various quality parameters so as to ensure their quality. Besides this, offer offered distribution blocks are available in varied specifications to our customers according to their requirements.